We recently went on a long car trip to see my sister. In total, it was about 14-15 hours including getting gas and bathroom/walking around breaks. I knew from past experience that it seems that the kids are always "hungry" in the car. I packed a special snack box in a Rubbermaid container and also a small cooler. This time I ended up packing granola bars, suckers, small bags of M&M's and Reese's Pieces, applesauce, fruit snacks, pretzels, mixed nuts, Scooby Snack graham snacks, Jiff peanut butter cups, and along with some napkins and plastic forks and knives. The cooler had celery sticks, apples, carrots, and pepper slices. Each of them had a reusable water bottle at their seats as well. Everyone went through it faster than I thought and we had to restock on the way home, but it seemed to have worked and kept everyone happy. 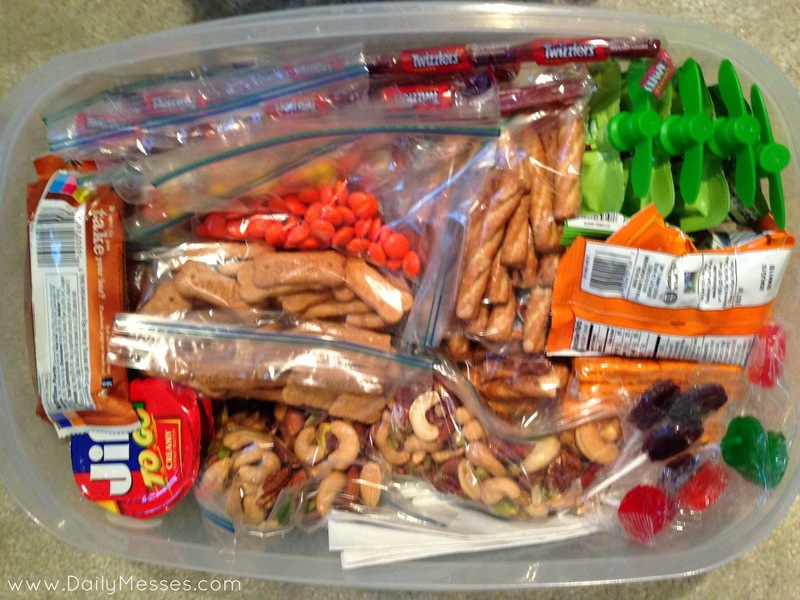 What snacks do you like to pack for a long car trip?